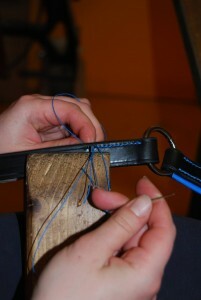 This week, it is the profession of saddler that is put in the spotlight. A professional you may know answered my questions. I will let you discover it through the interview that follows. My name is Laetitia sursain and I am 26 years old. The passion of the horse came simply, my mother is a rider and thus gave me the virus. There have always been horses at home (line horses and saddle horses, young horses and retirees). 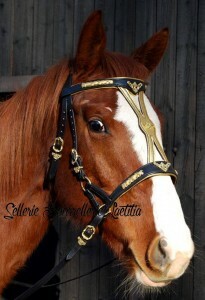 Saddler Saddler Since October 2012, located in Haute-Marne (52) in a small village, I decided to set up my saddlery. Passionate about my profession, I offer various articles, many for horses, but also our friends dogs as well as small leather goods, all made entirely by hand. Can you describe the profession of saddler? 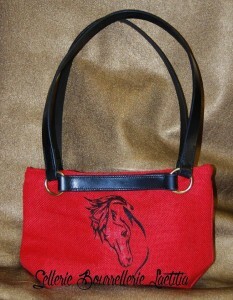 Saddler is a craft, very manual, and where you have to love what you do. What is your career path? What brought you to practice this job? 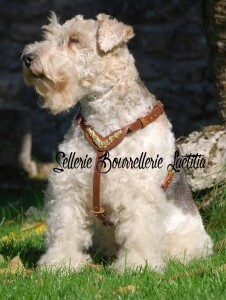 My desire to be Bourrelière was very fast (this is decided in one day) I am very manual, I like to create and to pass my passion of my profession in all my manufactures. In 2011, I passed a CCP (certificate of Professional capacity) over 3 and a half months, which allowed me to learn the basics of leather, choose skins, etc. In 2012, I went into further training over 3 weeks, on the manufacture of the English saddle, in order to know how to intervene on a saddle in case of repair. Can you describe one of your typical days at the workshop? I arrive at the workshop at 8:30 am, look at my order books and attack the manufacturing. I unfold my leather, size the strips needed, then I work them by passing the lampshade which is a tool that allows to ‘ cut ‘ the angles of the leather (pictured right), then I work the slices of the leather to no longer have this fluffy effect, and I tint them . I prepare the necessary loops for the control, then start sewing and assembling. I stop around 12h and then resume between 13/14h to finish around 7:30 pm in the evening. What materials, equipment or technologies do you use? 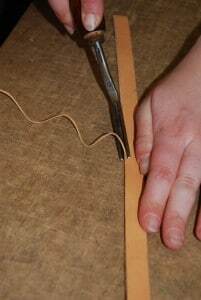 I only use leather for manufactures, no nylon or biothane in the workshop. My seams are made with linen and the buckle is either brass or stainless steel (which does not rust), everything is sewn hand, using the pliers of saddler, no machine… Using a diamond awl, which allows to pierce the leather to pass the seam with 2 needles. What training or diploma is required to access the trade? To settle on his account, in 2012, only the CCP was needed, but it seems to me that now it is necessary to course. My CCP was spent in the east of France for 3 and a half months in 2011, then in 2012, a complementary training in Haute-Savoie, at a saddler, over 3 weeks, to know how to work on the English stool. It is necessary to be rigorous, to listen to its customers, to be able to adapt to the needs of everyone, to be patient. The advantage of this job is already that it happens indoors, we can stay warm in his workshop and the advantage of a rural job, which allowed me not to settle in town, but in my small village of 60 inhabitants. What are the constraints, risks and disadvantages? The constraints? Back pain.. We are always in the same position, to sew, a little bend on our seat. 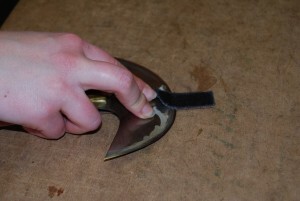 There is also the risk of working with cutting tools like a half-moon knife to adorn the leather (example in picture opposite), such as awls for piercing leather and we are not immune from carpal tunnel operation in the years to VE Nir, our hands are working a lot. Do not be afraid to work overtime in the workshop, it is only a craft where the hours can not be counted. For back pain, I move often, do not always sit in a sitting position, I change the way I work. What do you propose as products? 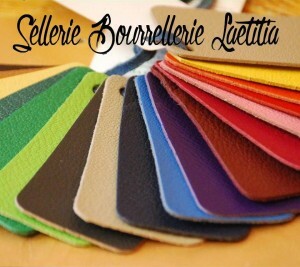 What type of leather do you use? 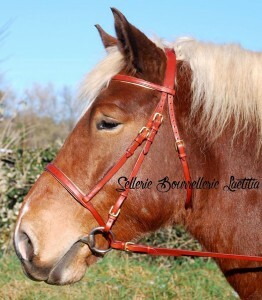 I propose products such as nets, side-pull, reins, mixed hiking,…. But also, harnesses, collars and leashes for dogs, as well as small leather goods like bracelets, necklaces, purses, bags, belts, key rings. Everything is entirely leather. The thickest, which serves for the bases of manufacture is the half dosset of vegetable tanning Force 4/4.5, nourishes +/-30% bought in a tannery in Belgium. In the case of linings and braiding, the fine leather is either goat or veal, also vegetable tanning, bought in the south of France. What are your prospects for evolution? I would like to propose, later saddles with my logo SBL, make it custom, at the request of the customer and match them to the net. 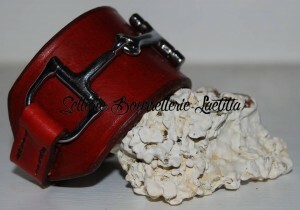 Laetitia (her Facebook page here) was kind enough to give us a 10% discount coupon on her creations, for our contest! Previous PostTest Sleek, finally the brush.